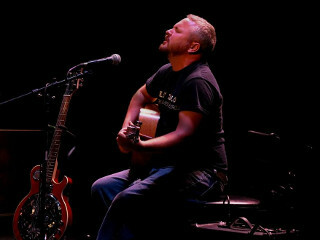 Achilles Tenderloin is Joe Augustin, a songwriter from Richmond, Indiana who has been performing and recording original music since 1998. Achilles Tenderloin's latest release, Stronger Than Wine, was released in August 2014. A new album is in progress and expected to drop later this year. Augustin will appear in Indy with Bigfoot Yancey on April 10 at Indiana City Brewing and, again, on May 9 at Virginia Avenue Folk Festival. Augustin adopted the Achilles Tenderloin name in 2005, after recording his second full-length album, The Bath. In 2012, after a brief hiatus, Achilles Tenderloin released the Blind Oedi EP and has spent the following 3 years expanding his live circuit to include venues spanning Indiana, Ohio, and Northern Kentucky. More recently, Augustin also founded and organized a number of concert series and charitable events, including Lyricists' Corner (current, continuing), SoNA (current, continuing), Roscoe's Odyssey (2014), and Big Dawg On My Trail: Blues Brews & Arts Festival (2014). SoNA is a charitable group founded in 2013 by Augustin and Kevin Milner that hosts several music events throughout the year in Dayton, Ohio.